All brick Lake Hartwell waterfront home with over 4000 square feet of finished living space! 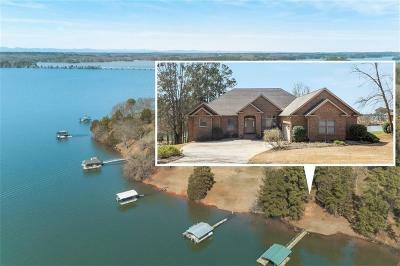 Less than 4 miles from I-85, this is among the most conveniently located areas on Lake Hartwell. 207 Edgewater Drive is just 14 miles from Clemson, and those commuting to Greenville can reach their destination in 30 minutes. It's central location is one of the reasons Lake Hartwell has become the southeast's most popular recreational lake -- we're 2 hours from either Atlanta or Charlotte, and only 4 hours from Charleston. By water, this is one of the quickest boat rides you can find to Portman Marina (Lake Hartwell's largest), where you can enjoy waterfront dining at Nami & The Galley. This home has much to offer beyond location, including a spectacular lake lot. Regardless of the overall lake level, you'll always have water under your dock! Beautiful long lake views can be enjoyed from the dock, and you have a gentle slope toward the water. A single slip covered dock is already in place. Inside the home, you'll find 12 foot ceilings with extensive crown molding, hardwood floors, and arched entryways. The impressive kitchen features plenty of cabinet space, center island, solid surface countertops, under cabinet lighting, breakfast area, and a walk-in pantry. Beyond the kitchen is a cozy keeping room/den which is the perfect place for watching TV after dinner or playing games in front of the fire. The sizable master bedroom includes a bay window overlooking the lake, glass door leading out to the screened porch, two walk-in closets, separate dressing/vanity area, and a full private bathroom with walk-in shower and jetted tub. Also located on the main level area a walk-in laundry room, powder room, two additional bedrooms, second full bathroom, and a built-in office area in the hallway. Downstairs on the terrace level, you'll find a large multipurpose/rec room that would be great for billiards or even an additional living area, and just beyond that is a room currently used as an art studio but would make a great workshop, home gym, or just about anything you can imagine. A fourth bedroom, additional full bathroom, and abundant storage space complete this level.